Certain methods result in fishing vessels pulling in large amount of animals they didn't intend to catch. One environmentalist told DW large-scale fishing is possible without such bycatch. A specialist in the management of threatened species of vertebrates, particularly birds and mammals, Barry Baker has worked for 25 years with the Australian Environment Department. His work over the last two decades has focused on the development and implementation of recovery plans for threatened species, threat abatement plans for key threatening processes and wildlife management plans to resolve interactions between wildlife and humans, including the harvest of native wildlife. As an environmental consultant he has continued to work on threatened species and by catch issues. Deutsche Welle spoke with Barry Baker to learn more on what solutions are there to the problem of bycatch, the incidental catch of an organism in fisheries. Deutsche Welle: How extensive the problem of bycatch when it comes to tuna, a common fish most people are familiar with. When fishermen set out to catch tuna, how many other fish do they typically end up catching incidentally? Barry Baker: For example in some tuna fisheries, 70 percent of animals in a tuna fishery are sharks and that can often have a severe impact on the shark populations. While fisheries may be taking into account the effect of the fishing on tuna species, in many cases they don't take into account the effect of that fishing on sharks. I don't have global figures at my fingertips, but there is an awful lot of bycatch associated with tuna fisheries. It's not just other fish that they catch. They also catch other organisms like albatrosses - it's a serious problem in tuna fisheries. How are birds getting mixed up in fishing nets and hooks? The principle problem in tuna fisheries for sea birds is with the use of a long line method. This is where, in some cases, up to 100 kilometers (62 miles) of fishing line is pegged out from the back of the vessel. There might be three to 3,500 hooks attached to that long line, and as the baits are cast over the back of the boat, there is a period of about thirty seconds to a minute when the baits are near the surface of the water column and birds are able to access the baits before it sinks out of reach. They get hooked through the bill and dragged under by the weight of the line and subsequently drowned. You've said it's a rare statistical event that birds are caught, or that bycatch happens at all. Why is it a problem? It's a rare event because you might catch one bird if you set 3,000 hooks. But it's a problem because if you look at the amount of fishing effort in the oceans is huge. It's been estimated, for example, that over a 100,000,000 hooks a year are set south of 30 degrees south in the southern hemisphere. When you multiply the effect an albatross populations through catching one bird in every 3,000 hooks, you soon have high levels of bycatch. These birds that live in the slow lane - they may breed once a year, some species breed maybe every two years, they produce one chick, they don't breed till they are five or 10 years of age and with demographic characteristics like that, you've only got to increase mortality by 1 percent or 2 percent over what would naturally be occurring for populations to start to decline. Let's get back to fish, why can't these fish that are caught on the side be sold? Well sometimes it relates to processing situations. Some sharks have high ammonia contents and if you are not intending to target sharks and you catch them, the product will rapidly spoil if it isn't treated appropriately. But I should add that in some of the tuna fisheries you often form the opinion that they are really in effect shark fisheries with a tuna bucket. The issue I see in those fisheries is that if you are catching large amounts of shark, you should try to use them sustainably, and you should be assessing the stock. That does not happen in very many cases. Are you saying that some fishing fleets go out with intent of trying to catch as many sharks as possible and are happy to catch a few tuna on the side? No. I am saying that the method they use isn't particularly selective. If you were looking for fish for tuna, then your ideal fishing operation is one where the method you use to catch the target species catches nothing but the target species. If you catch anything else that isn't a target species, then it's bycatch - and if you use it, it's often viewed as a byproduct. But in many cases, in a tuna fishery for example, a lot of the sharks that are caught are not used. Sometimes they are thrown back into the water and, in what is now an illegal practices, sometimes their fins are removed and they are thrown back into the water. Is it possible to throw back fish alive and allow the fish to continue living, or is the fate of all fish thrown back alive after having been caught pretty much death? Again it depends on the methods that you are using. The examples I have been giving are related to long line fishing but, for example, if you are using trawl gate to catch target species - and in many trawl operations they might catch on target species to 10 non-target species -the fish get damaged in the process of being caught in the net, the net as it's lifted onto the deck causes a lot of compression and so if you do have a non-target animal there, and you return it to the water it could as well be dead when you return it. In terms of solutions, is it even possible to build baits, traps and hooks that specifically target one species? Certainly. For many forms of bycatch, there are solutions and good examples where solutions have been found exist in fisheries managed by the Commission for the Conservation of the Antarctic Marine Living Resources, which operate in the waters of the Antarctica. There was a highly prized fish called Patagonian toothfish that had a very high level of seabird by catch 10 or 15 years ago. But through the rigorous application of appropriate management techniques, including bird scaring lines and by applying additional weight to the long lines to help them sink quickly out of reach of the sea birds, that essentially has seen bird by catch reduced from many thousands of birds to trivial units. They may only catch 15 or 20 birds a year. Making these changes is going to cost money. How receptive has the fishing industry been to proposed changes? In most cases not particularly receptive at all. Fishermen always guard about the bottom line. That's the challenge for people who are interested in conservation. To point out to fisheries' managers their responsibilities and the Food and Agriculture Organization's responsible code of conduct for fishing, to essentially encourage fishing to be undertaken on an ecosystem-based approach. If fishermen decide that they want to solve a problem, in many cases solutions can be found. How severe is bycatch to the overall problem of trying to achieve sustainable fisheries? I think it's one of the most severe problems that the fishing industry at this stage is faced with. In many cases we've seen in fisheries management organizations, and their scientific committees propose technical solutions, but when you get to the commission meetings and recommendations to change fishing methods, I see a lack of political will. A school in Uganda not only teaches classic subjects, the kids also make charcoal for the kitchen, tend a garden and have a fish pond. It saves money and teaches them to preserve resources. It's a lesson for the future. 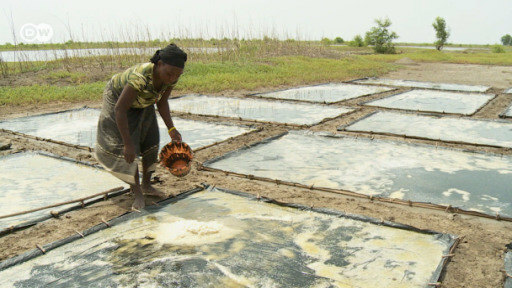 A program in Niger is pairing disabled people with benefactors who give them the chance to use a section of land to grow produce. Not only can they feed themselves and their families, but they can also make a profit. After analyzing why the country's mangroves were being cut down, an NGO finally had the right battle tools: better ovens to smoke fish, more effective rice planting and a way to use solar power for salt production.